The four-year project could lead to improved diagnostics and new treatments for hereditary heart conditions. Cardiomyopathy affects as many as one in 500 people around the world and can often be fatal or have lifetime health consequences. The researchers will be studying mutations in three important proteins that play a key role in healthy heart function. Heart muscle is made of tiny thick and thin filaments of proteins. With the help of electrical signals, the rope-like filaments bind and unbind in an intricate and precise architecture, allowing heart muscle to contract and beat. The thin filaments look like beaded necklaces and are made of actin, the most abundant protein in the human body. Tropomysin, another protein, wraps itself around the actin filaments. Tropomyosin together with two other proteins, tropomodulin and leiomodin, at the end of the actin filaments act as a sort of cap and determine the filament length. “It’s beautifully designed,” says Kostyukova, whose research is focused on understanding protein structures. In families with cardiomyopathy, genetic mutations result in formation of filaments that are either too short or too long. Those affected can have significant heart problems that cause disability, illness and death. The researchers will use state-of-the-art approaches to make the key proteins and study them at the molecular and cellular level. The work entails designing the molecules, constructing them at the gene level in a plasmid, and then producing them into bacterial or cardiac cells. The researchers hope in the long term to identify the components and molecular mechanisms that regulate thin filament architecture, whether diseased or healthy. “Better understanding of the thin filament’s function and its regulation is critical to understanding muscle disease pathogenesis, to improving diagnostics, and to potentially identifying novel drug targets,” said Kostyukova. 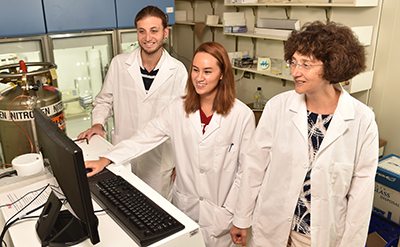 The multidisciplinary group is collaborating on the grant with a research team from the University of Arizona led by Carol Gregorio, director of the Cellular and Molecular Medicine Department. WSU’s group has expertise in protein structure, structural biochemistry, and properties of actin filaments and regulatory proteins. Dmitri Tolkatchev, assistant research professor in the Voiland School, will be using nuclear magnetic resonance tools to study the proteins and mutations at the atomic level. The work is in keeping with WSU’s Grand Challenges, a suite of research initiatives aimed at large societal issues. It is particularly relevant to the challenge of sustaining health and its theme of treating disease. Tina Hilding, Voiland College of Engineering and Architecture communications, (509) 335-5095, thilding@wsu.edu.